The nonprofit Foundation originally was operated by the Industry Council for Tangible Assets (ICTA) but recently left ICTA. As of November 20, 2018, the Foundation’s Board of Directors now is composed of volunteer members of the Professional Numismatists Guild (PNG) Board, which will handle the administrative duties and assist with fund-raising needed to support ACTF’s efforts to fight fakes. “The Foundation continues as a 501(c)(3) corporation and is separate from PNG. All donations to ACEF are tax deductible,” emphasized the Foundation’s and PNG’s Executive Director Robert Brueggeman, whose background is in law enforcement and security. ACTF Homeland Security exhibit. Hover to zoom. Deisher will serve as Director of Anti-Counterfeiting for the Foundation and as the coordinator for its Anti-Counterfeiting Task Force. Expanded the Anti-Counterfeiting Task Force’s Expert Network and providing experts to assist law enforcement in the identification of counterfeit coins and bars. The largest case prosecuted during 2018 involved seizure of thousands of counterfeits. If the fakes in this single case had been genuine they would have had a retail market value of more than $48 million. 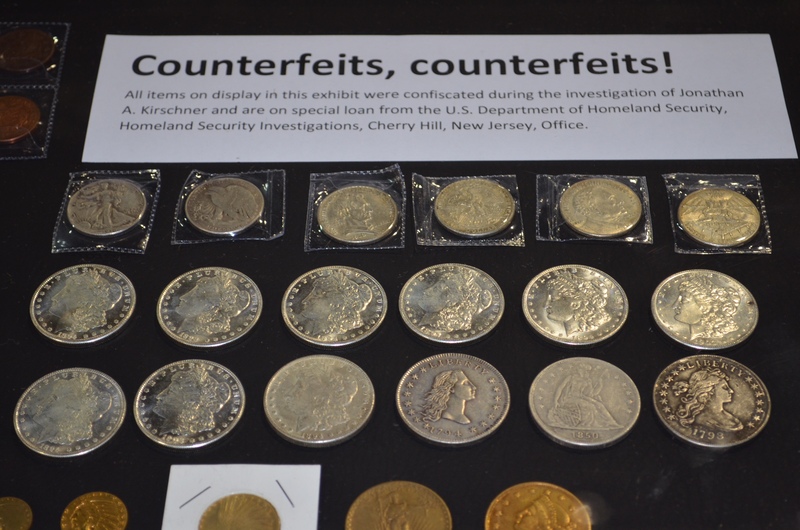 Sponsored and mounted an unprecedented five-case, public education exhibit of counterfeit coins and bars during the American Numismatic Association’s World’s Fair of Money in Philadelphia. The counterfeit items were made available through special arrangement with the U.S. Department of Homeland Security Investigations. Developed and conducted the first survey to determine the prevalence of counterfeit coins and precious metals bars in the U.S. marketplace. For additional information or to make a donation, contact the Anti-Counterfeiting Educational Foundation at 28441 Rancho California Road, Suite 106, Temecula, CA 92590. The phone number is 951-587-8300. Additionally, you may contact ACTF Coordinator Beth Deisher at 567-202-1795. I recently purchased several different coins from “Chinese coins” that are Latin/Asian and American. The sellers used different names for dealers, but it is same person/shop. They state they are silver and they look very much like normal coins, But they are a scam/fake coins. Counterfeit, but the auction; buy now does nothing, because they lose their 10% profit. none well sell silver coins for .98 cents/Buyer beware! I will contact my congressperson and i hope to put a stop to this import! I have found there are even common dates of Franklin half dollars that are fake. Still have not seen Mercury dime fakes but it’s comming! Beware.